#WeNeedDiverseBooks | Sheryl Kaleo... var scss_share_image="https://www.sherylkaleo.com/wp-content/uploads/2015/11/Sheryl-Kaleo-Banner-copy-copy.jpg"
← Donor Part 1 and Part 2 is on sale for $0.99 Everywhere! My #WeNeedDiversity contribution is posted under my bio–both the image and my essay about what it means to be a person of mixed race and mixed cultural heritage. But I realized that people might not get why I chose to do a poster about Oscar the Red. Oscar turned a year on October 18th, which basically means that half of the time he’s a lot like a puppy, and the rest of the time he’s a lot like an adolescent. He’s our third dog and our second Boston Terrier. Our first Boston Terrier, Scooter, was easily identified as a BT because of his black and white coat that made him look as though he wore a tuxedo. In personality and looks he was a gentlemanly dog. Oscar on the other hand…well he’s still a puppy. We won’t know for a while who he’s really going to be, but so far, he’s half-adorable and half-rascal. Oscar is also very different from Scooter in the color of his coat. He’s not tan–although there are tan Boston Terriers. And he’s not brown…although, he’s been called that. But what he’s mostly been called by people who don’t know is a list of other things. Is he a bulldog puppy? Is he a boxer puppy? Is he a french bulldog? And the one consistent remark we get from people is–I didn’t know they (BT’s) came in brown/red/tan. Which is the point of why I bring it up. 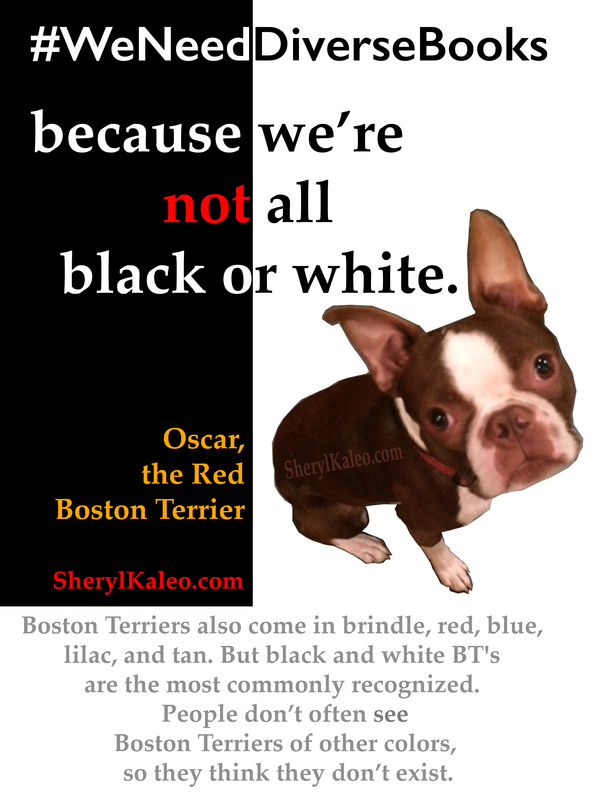 People don’t often see Boston Terriers of other colors, so they think they don’t exist. Don’t exist…as in nonexistent. And that’s the way it is in this media rich generation we live in. The current media market has skewed storytelling to a very narrow bandwidth to the point where it seems other ethnic and racial groups are nonexistent. They’ve done so based on this idea that people aren’t interested. But research and the history of storytelling tell us that people’s interests can be captured and held based on how the story is told. In Wired for Story: The Writer’s Guide to Using Brain Science to Hook Readers from the Very First Sentence by Lisa Cron, Cron talks about how we humans are intrinsically wired to crave messages, warnings, and entertainment in the form of stories. We just can’t help ourselves. It’s in our survival mechanisms and in our DNA. Which then begs the question, do we need to know about other people of diverse races and cultures? Yes. There is a reason why we admire people who are well-traveled or cosmopolitan in nature. They seem to handle new situations so easily. They seem to worry less about the little things we all get trapped in. Perspective puts us at ease with the unknown. Perspective is what we gain learning about other peoples, other cultures, other lifestyles. The less we know about the people around us the more our worldview is skewed, our perceptions off, and our reality so very narrow that we often find when we are presented with new situations involving new people we falter and fumble. When we learn about other people, we gain greater knowledge not just of the world around us, but of ourselves, through a greater sense of perspective. So when people ask about Oscar’s red coat, I tell them that BT’s come in many colors including brindle, tan, blue, and lilac. I share this information as if it’s the coolest thing that they asked, because it is–because they’re sharing their curiosity and wonder. What a gift. And I often find that they’re just as delighted to learn that little tidbit of information. I often find it’s how I share the information that makes a difference, not the what. But that’s another topic for another blog post. For more information about the #WENEEDDIVERSEBOOKS campaign, click the image to visit their site. This entry was posted in General, WeNeedDiverseBooks. Bookmark the permalink.